I got bored with the first character concept so I put together this one using both Werewolf: The Apocalypse and Mage: The Ascension. Connor was born to a Fianna Kinfolk and Uktena Garou. She died in childbirth, and was named by his mother. That is all Connor has ever been told of her. His Ahroun father, Jack Blends-the-Fang Shikoba, was a proud hero of note. Blends-the-Fang played a pivotal role in the defense of the Wendigo caern of Painted Sands. Again and again, it was his warrior cunning that lead the outnumbered defenders to repel the forces of the Wyrm time and time again. When the attacks subsided, Blends-the-Fang returned to his home the Roadrunner Sept and spent some time to care for his young kin child. Yet the harsh realities of war with the Wyrm were never far from his mind, and Blends-the-Fang was not able to be the loving single father that a child needed. He could only be a warrior; his pride demanded it. So the elders sent him off to the front lines of the war. Blends-the-Fang left his son with his kinfolk brother George Shikoba and his wife Ann. The two were childless, and overjoyed to be able to help the tribe. George himself had always been afraid he couldn't have children, and raising Connor was a way to keep from being looked down on as a useless kinfolk. Also, George was incredibly proud of his older brother who'd always treated him with respect. George would do anything for him. George and Ann raises young Connor, until something incredible happened. Connor awakened. One day when Connor was only 11 years old, Ann had found him after school having a conversation with someone only he could see. She had him evaluated by her Aunt Jane, the sept's Caller of the Wyld. She determine young Connor had a spirit guide. He was no ordinary kinsfolk, but supernatural. When the elders were told of this, a moot was called immediately. What to do with the child was the subject of great debate. With the numbers of Garou falling so rapidly in recent times, the use of kinfolk in the war against the Wyrm was growing. For the Uktena, the prospect of an Awakened Kinfolk presented a unique opportunity. If such a child could be trained to harness their "gift" in the service of Gaia (and calling the ability a gift provoked much heated debate) then perhaps this Kinchild's bloodline could become a potent weapon against the enemy. It would be a grand experiment, pushing the boundaries of knowledge to see if a non-Garou could speak with the spirits and walk the Umbra in the Uktena way. Some elders were vehemently opposed to such an endeavor, but in a war where resources were slim and every advantage invaluable, eventually they were convinced with a compromise. The child would be cursed such that he would never be able to use his "gift" on Garou free of Wyrm-Taint. In this way the child would be able to be controlled, and in the event he should fall to the Wyrm's embrace, easily killed. It was settled, and the Skywalkers were tasked find a spirit who could teach such a ritual. When it was found the elders performed this rite on young Connor, and thereafter his gift was powerless against Garou free of Wyrm-Taint. Then Connor's training begun. Soon after he said his goodbyes to his aunt and uncle, moving in to the Roadrunner Sept where a chosen few were to conduct the grand experiment. He was assigned to learn from a group of elders. Eventually, they hoped he would be exposed to the teachings of all the Uktena societies. Connor's training was at times brutal and unforgiving. At other times he found himself inspired and hungry to learn. Each of his teachers took a different approach to training him. At first Connor divided his time exclusively between the Earth Guides and the Skywalkers. The Earth Guides made certain he attend public schooling, and afterwords he would attend lessons with the Guides learning tribal lore and customs. In the evenings, the Skywalkers taught him of the Umbra. While the everything he was taught helped him get by in Garou society, in the quiet moments between his teachings and duties it was his spirit guide he learned from the most. Yet it's appearance was infrequent and mysterious. At times, Connor would make great leaps and bounds. His teachers mystified by his new abilities. Then were times where Connor made no progress. The Skywalkers were particularly frustrated with Connor's unpredictable competency. During reports to the elders, they made sure to claim victory for his successes, and portray him as a lazy child when his abilities plateaued. After Connor had graduated from high school it was decided he would pursue no further formal education. Instead, Connor would be exposed to new teachers. He was sent to live with his Aunt who was also of the Wyld Children. There Connor learned about the wilderness, growing things, and survival in the Wyld. When his aunt had decided he had learned all she could teach a non-garou, Connor was sent to stay with a Bane Tender. It was a miserable experience. The time was spent at an unused yet heavily protected caern which stood above a sleeping bane. Much of what he knows about the Wyrm was learned there. After a time, when Connor could not bare the isolation any longer his Bane Tender mentor recommended to the Elders that Connor move on. The Web Walkers took up his instruction in name only, as they sent him away to a city college. For the first time in his life Connor felt like he had a small measure of freedom. On weekends he would travel to meet with NAMID Ghost Dancers, learning their ways and making ties with other Uktena kinfolk. It was during this time away at college where Connnor learned the most from his spirit guide, made friends, and many fond memories. After graduation, Connor was brought back to the sept and taken once again under the tutelage of the Skywalkers. The only group Connor was never exposed to were the Path Dancers. It was several years before he'd ever even heard them mentioned. It had always made Connor wonder what they were hiding. Shortly after Connor had returned to the Sept, he found that his father had returned as well. Sadly, Jack was dying. During his last battle with the Wyrm, Jack was infected with some kind of rotting disease. The healers were unable to cure him. After learning that there was no hope, Jack requested to live out his final days in the home of his brother George and sister-in-law Ann. It was only now that he was dying that Jack Blends-the-Fang realized how much of Connor's life he'd missed. There was much arguing and tears, yet in the end Jack reconciled with his son. Connor then spent every waking moment with Jack, who told him his many, many war stories. More importantly, he told Jack that there was a powerful Wyrm spirit he had angered during his many defeats of the Wyrm. One day, he told Connor it would come for him and that he had to be ready. The spirits had told Jack that only a Garou of his bloodline could defeat the spirit that was soon coming for his son. Jack took this to mean that he must somehow make his son a Garou. Deep down, Jack had always had another regret - aside from missing Connor's life - he did not sire a Garou son. It was his failing that he never accepted Connor the way he would have if he were born Garou, but that was behind them now. Still, there was one way for his wish to come true. On his deathbed, he told Connor and George about the Skinners. Over the years fighting the Wyrm, Jack had communed with the spirits many times looking for a way to make his son Garou without Wyrm-Taint. The spirits obliged. Jack told Connor how to become a skinner, and that if he were to assemble five skins of Garou given willingly he would be able to ascend as a Garou without Wyrm-Taint. To this end, Jack had George promise to prepare his own skin in secret, and to offer it to Connor when the boy had obtained the other four skins from willing Garou. Connor was horrified, but ultimately promised his father that one day he would fulfill his final wishes. Jack soon passed into the next world, and George in the utmost secretly fulfilled his grisly promise to his brother. When the time for mourning had passed, the Elders said that now Connor was an adult it was time for his abilities to be honed so they would aid the Uktena. No longer were the lessons about Tribal or Umbra lore. Instead he was given instruction in the caern's Bawn. This caused outrage amongst the resident Garou. Where he was previously considered a nuisance by some and a harmless experiment by others, Connor was now an Awakened being brought into a Caern. Who knew what harm he could do? Many Garou that Connor had previously looked up to now treated him like an intruder. This troubled Connor greatly, but as he was taken regularly on short trips into the Umbra he was able to put aside his sadness and replace it with wonder. For years he'd been told all about Gaia, spirits, and the magic of the world. At this point in his life he was even able to manifest small feats of magic. The other side, the Umbra was magic. Connor put all of his focus into learning how to harness this side of himself. His spirit guide attended him regularly. Within a month of his first spirit walk, Connor had learned how to sidestep on his own. At the next moot when the Skywalkers reported his progress, the Elders decreed Connor was ready to serve the tribe. He was to be assigned to a questing pack of Scouts and fulfill his duties. MA 121 Avatar: May rebuild a pool of/expend three Quintessence. MA Conditional Magic: Due to a ritual performed on him by the Uktena Elders, Connor's magick is powerless against Garou free of Wyrm-Taint. MA 122 Dream: He gains helpful insight. PGG 168 Foe from the Past: A powerful spirit creature has sworn a vendetta against his ancestor's descendants. MA 123 Influence: Your peers recognize you. TBD 41 Independent Shaman: Shamans who Awaken without a mortal teacher generally possess little information about other mages or the practical realities of using magic. The Awakened is taught by a relatively alien but generally helpful spirit. KUH 69 Mirrors of the Soul: The interesting side to being an Awakened Kinfolk is that True Magick, if coincidental, often simulates (with less Paradox) Garou Gifts. Vulgar Effects, even if successful, earn one point of Paradox. It's also more difficult to cast vulgar magick (without Sleeper witnesses, highest Sphere +4; with Sleeper witnesses, highest Sphere +5). Treat Garou as Awakened for determining difficulty and Paradox. Plus, exercise a little creative judgement in determing what's vulgar and what's not. Many mage Kin actively study how Garou Gifts manifest, and they mimic Gifts with Effects, particularly when they practice magick upon werewolves. KUH 52 Pure Breed: His Garou father was a minor hero in recent memory. He is one of the few heroic bloodlines of the Uktena that have flowed largely unbroken since the days when legends were new. KUH 54 Supernatural Kinfolk: Despite your magickal status, the Uktena accepts him as Kin (although they don't necessarily think of him in glowing terms). Individuals outside his immediate family may not like him, and other tribes probably won't treat him well - they may not even recognize him as Kin. After all, most werewolves view mages as caern raiders. Likewise, his "other" life may sometimes impinge on Kinfolk business. Still, there's value in knowing about both worlds. TU 81 Totem of Cunning (Roadrunner): Relying more on fast footwork than wings for escape, Roadrunner symbolizes both an agile body and equally agile mind. Packs who follow Roadrunner are known for quick thinking and mental flexibility. The pack gets +1 Intelligence and +1 Enigmas. Roadrunner's packs may not hunt roadrunners, and they must do what they can to protect desert lands from destruction and defilement. TU 85 The Roadrunner Sept, Arizona: The Roadrunner Sept guards an ancient caern of Wits, and the sept members honor their totem by using its name as their own. The sept consists of several packs and totals about 50 members. It is based south of the Cow Springs rock formation, not too far from Zihi-Dush-Jhini Peak, in meandering lands that touch both the Navajo and Hopi reservations. While almost exclusively Uktena, the sept had a decent relationship with the nearby Wendigo Sept of the Painted Sands, until that sept fell recently to attacking forces of the Wyrm. Now about a third of the Roadrunner Sept has traveled to the Painted Sands caern to guard it against further incursions. Most members of the Roadrunner Sept devote themselves to studying, interestingly enough, Aztec culture and artifacs. Many have Kin nearby who are farmers or ranchers. Caern: Level 4,Gauntlet: 3. 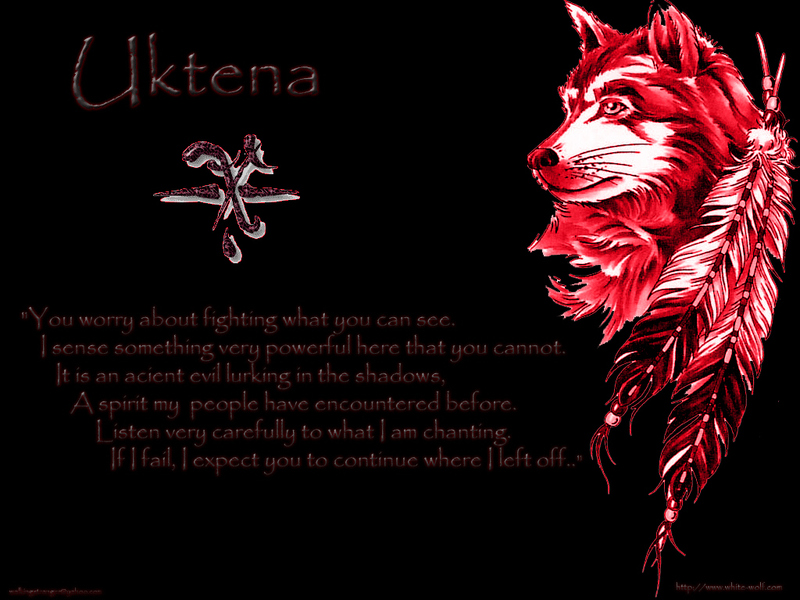 TU 63 Uktena Kinfolk: Uktena cherish their Kin, both wolf and human. They enjoy the camaraderie and the sense of family. In turn, Uktena Kinfolk generally support the sept with whatever skills and help they can provide. Many join in the celebrations and dances of the Uktena, and some are even trusted with vital secrets. It isn't unusual for an Uktena character to have two or more dots of this Background. TU 63 Uktena Mentors: The Uktena have long-standing traditions about teaching the young; it's not so much about school or books as it is watching and learning from elders. Thus the role of mentor to student is almost sacred in its depth. The bond is a deep one, and most often not just one but several elders mentor the Uktena youth (a small group of Rank 4 and under). Academics 2 - College: Casual intellectual discourse is no problem for you. Awareness 2 - Practiced: You've felt the supernatural all around you, and you're sure that there are "things out there." Computer 1 - Student: You can play computer games. Cosmology 3 - Masters: Having visited the Umbra, you're no stranger to other worlds or creatures. Dodge 3 - Competent: You dive, bob and weave with grace. Drive 1 - Novice: You can drive an automatic transmission. Enigmas 3 - Masters: You can puzzle out the motives of spirits and madmen. Expression 2 - Practiced: You have a good vocabulary. Investigation 1 - You've read plenty of detective novels. Meditation 2 - Practiced: Meditation helps sometimes when you're agitated. Occult 2 - College: Curiosity has gotten you into the occult, but it's bigger than you've imagined. Subterfuge 2 - Practiced: You hide your true feelings well. Survival 2 - Practiced: A few camping and survival trips are under your belt. Tribal Lore 2 - Practiced: You know the short version of your people's history. You can grasp kinship structure if your tribe follows a different standard. *The PDF's page numbers are used instead of the book's.